Being a function-over-form kinda guy, I was skeptical when presented with Vifa Oslo’s high-fashion looks and $549 price tag. The absence of any protection from the elements only amplified that emotion: You’ll look like a swell strolling the Côte d’Azur with this portable speaker, but you’d better not take it to the beach. It took just a few listening sessions for me to reconsider my doubts. Vifa is a new brand to me, and its marketing is clearly aimed at the hipster set (of which I am most definitely not a member). But it turns out the company was founded in Denmark way back in 1933, and it has spent most of its existence building loudspeaker units for other manufacturers. It only entered the retail market on its own in 2014. 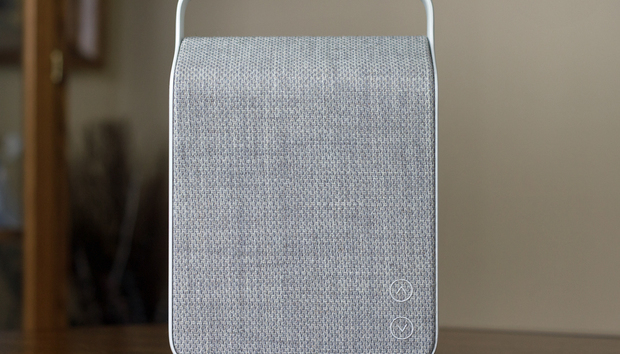 The Oslo is part of a family of wireless speakers named after Nordic capital cities: Copenhagen, Stockholm, and Helsinki. The first two models are larger than the Oslo, while the Helsinki is slightly smaller. Embroidery marks the location of the volume-control buttons. There’s an unmarked NFC sensor between them, and an LED status indicator above. Volume up and down buttons on the lower right-hand side of the speaker are marked with icons embroidered into the plush fabric, which feels as good as it looks. A circular LED above these buttons indicates the speaker’s status (Bluetooth, Bluetooth pairing, and standby mode). The Oslo supports the aptX codec, but Spotify subscribers will regret that it doesn’t also support Spotify Connect. There’s an unmarked NFC sensor in between the two buttons, which I didn’t make use of because I didn’t know it was there (I know, RTFM). There are no buttons for track control, so you’ll need to rely on your device to skip around your playlist. The speaker paired to my Samsung S6 Active smartphone for media audio only, so you shouldn’t have to worry about your phone conversations being played over the speaker. A small panel on the back of the speaker harbors an on/off switch, power and aux inputs, and a battery-life indicator. There’s a micro-USB port there too, but a rubber plug identifies it as being for service only. Vifa doesn’t disclose which type of amplifier is onboard or how many watts it produces, but I was pleasantly surprised at the volume this thing put out. The speakers themselves are mounted to a polycarbonate enclosure inside the aluminum frame. There are two 50mm aluminum cone full-range drivers with neodymium magnets, and two 65mm woofers mounted back-to-back in a force-balanced configuration: Each driver operates in opposition to the other to reduce distortion and cabinet vibration. This image is taken from Vifa’s website to illustrate how the force-balanced woofer is designed. It was either this or take apart the speaker, and I didn’t think Vifa would appreciate getting back a broken speaker. The woofers are assisted by a pair of passive radiators. Having one woofer facing forward and the other backward mitigates the need for a vertical surface behind the speaker, off which to bounce low frequencies, but the Oslo still benefits from such placement. I played the Oslo in several rooms in my home and was pleased with its performance everywhere. When I put it on my breakfast bar, faced it toward the great room, and cranked the volume, the speaker filled both rooms with sound without spilling over into distortion. Listening to Bonnie Raitt’s “I Can’t Make Your Love Me,” from her album Luck of the Draw, I was pleased with the level of detail I could hear, including the soft patter of the drummer brushing the snare and the shimmering sound of the cymbal that open the song. When the electric bass came in about 16 seconds into the track, and then Raitt’s heart-wrenching vocal about 20 seconds later, I knew I was going to like this speaker. There’s a battery indicator and an 3.5mm aux input on the back of the Oslo, but its micro-USB port is strictly for service only. The speaker won’t perform as a USB audio device and it can’t host USB storage. Bass response improved by a couple of notches when I moved the Oslo into my more acoustically neutral home theater and placed it in the center of my entertainment center, in front of the TV. The music bounced off the vertical surface behind the speaker. The speaker did a great job rendering the crunchy guitars, honkin’ tenor sax, and growling vocals on Joe Strummer & The Mescaleros’ “Cool and Out,” from the band’s Global A Go-Go album, which I’d ripped from CD and encoded as FLAC files. As is common with smaller portable speakers, however, I missed hearing distinct stereo separation. On the title track to that same album, for example, the recording engineer ping-pongs many sounds—hand claps and the ratchety sound of the güiro,for example—from left to right and back again. You don’t get that effect with speakers like this because the drivers are too close together. For critical listening sessions, you should stick with conventional stereo speakers or headphones. On the other hand, conventional speakers are hard to take with you, and headphones are only good for a party of one. The Oslo can entertain a good-sized party, indoors or out, but with one significant limitation: Its internal components are not at all protected from the elements. The user manual warns “please ensure no exposure to rain, moisture, high humidity, or sources of heat.” The speaker won’t tolerate freezing ambient temperatures, either, with an operating range of 40- to 105 degrees Fahrenheit. And while that wool fabric is beautiful to look at, it’s not the easiest textile to clean compared to most synthetic fibers—or a metal grille, for that matter. Is Oslo the destination for you? Despite Vifa’s marketing materials, you don’t need to be a fashion plate to enjoy what the Oslo has to offer. Yes, it’s a beautiful speaker to look at, but it delivers the goods in the audio department, too, with high fidelity and plenty of volume. The sturdy aluminum frame and polycarbonate enclosure protects its components from hard knocks, but it’s not weatherized at all. I’d keep it far from the edge of the pool and think twice about using it around sand and snow.